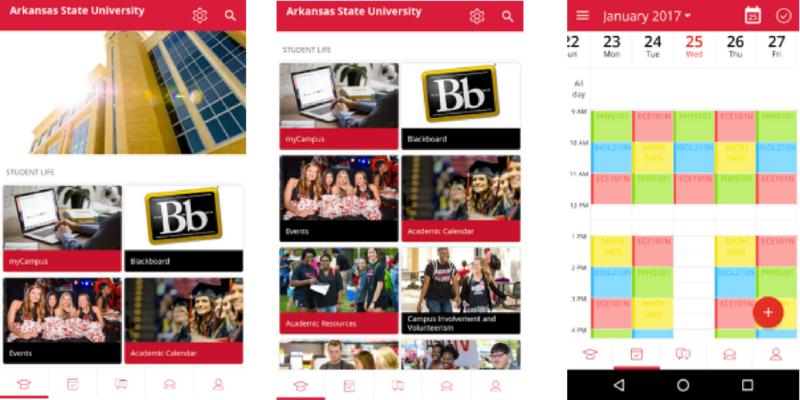 JONESBORO, AR – April 9, 2018 – Arkansas State University today announced the launch of a new mobile app designed to foster better communication and help students engage on campus. Built in partnership with Ready Education, which works with colleges and universities worldwide to improve student engagement, retention, and success, the comprehensive app will include message boards, event tracking tools, calendars, and other resources, all accessible through a single sign-on. Research suggests that nearly 100 percent of college-age Americans own smartphones, and individuals age 18-29 are the most likely to depend on their mobile devices as the primary tool for internet access and communication. To meet the needs of an increasingly digital generation, Ready Education has partnered with more than 200 colleges and universities around the world to develop campus mobile apps that help demystify the college experience for students and support retention. According to an initial pilot study, conducted at Lindsey Wilson College in Kentucky, first-year students who used the campus app were 17% more likely to return after the first semester than those who did not. Ready Education uses native mobile technology including customizable alerts, real-time feedback tools, and GPS navigation to streamline the campus experience for college students. Available for free to students through the Apple App and Google Play stores, the campus app integrates directly with existing Learning Management Systems (LMS) and Student Information Systems (SIS), providing a single platform for students to access information about courses, events, and other resources. Faculty and staff can use the platform to access rich analytics and data dashboards that help them process real-time feedback and improve the student experience.